Endless tap games have become quite popular in recent years. For those who don’t know, endless tap games don’t end. You continuously “tap” through the game until an obstacle stops you with the point being to achieve the highest possible score. Among so many of these games, choosing the best one can be quite hard. To help, we searched and discovered one incredibly fun and challenging endless tap game that will get you addicted to playing fast. Chunq is an endless tap game that is simple for playing and yet very challenging, getting you hooked to playing on your first try, testing your tapper skills each time. Developed on the Android platform, this tap game offers sharp graphics and entertaining sounds as you tap and jump and try to get high scores. Playing with Chunq, the cool and colorful character, you need to tap to make the Chunq jump to pass the obstacles and stay in the game as long as you can. Chunq has various features that will keep the player’s attention each time he plays this game. Just by tapping, the player needs to make the Chunq jump through the obstacles and stay in the game as long as he can. 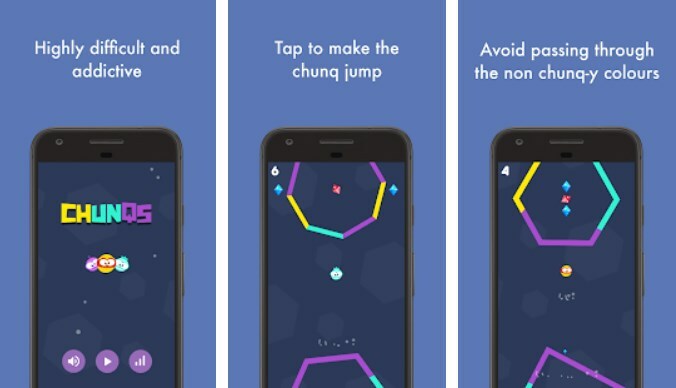 The endless tap game is very addictive and challenging, testing the player’s tap skills by making him jump with Chunq to pass through the colorful obstacles while being careful and avoiding to pass through the obstacles which don’t match with the color of the Chunq. The Chunq’s color is changing constantly and each player needs to watch out and match the Chunq’s color with the correct color on the obstacles to pass. Because the color of the Chunq is constantly changing, faster and faster as the player progresses, he needs to tap as fast as possible to pass. Each time the player successfully passes an obstacle he will get scores. On the way up, the player needs to collect as many of the diamonds on his way to get high scores. Players need to survive as long as they can to get their high scores, testing their tap skills and trying to become the ultimate tapper of this exciting tap game. Download this game on Google Play for free to test your skills by tapping and jumping with the Chunq!